Bailey Nelson is a multinational optical retailer that delivers chic, high quality eyewear at an affordable price. 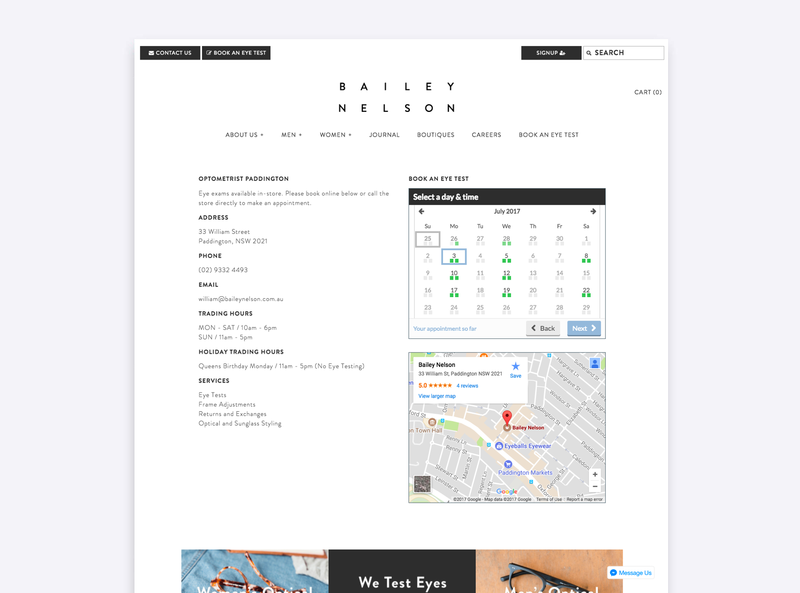 In order to maintain its competitive edge within the Australian retail market and poise itself for further expansion into international markets, Bailey Nelson approached us with the objective of increasing their conversion rate of online traffic to booked appointments across their Australian boutiques. To meet this objective, we modified several components of Bailey Nelson’s ecommerce store. Indeed, by carefully tracking the traffic to Bailey Nelson’s ecommerce store, we were able to identify the best sources of user engagement and alter the structure of the ecommerce store to reduce cart abandonment. We also implemented a number of conversion optimisation tools, including special discounts on certain items, and altered the layout of the product pages and the navigation bar. Using our Shopify Plus expertise, we worked together with Bailey Nelson to expand their business into Canadian and UK markets. We ensured that Bailey Nelson’s product range, theme and content were consistent across their regional shops. Furthermore, we localised each regional store to ensure payment gateways and local shipping and logistics were all set up to make the international launch a success. Given the success of these international launches, we will continue to work with Bailey Nelson on future projects to ensure that they get the best out of the Shopify Plus platform for their business.